Getting thousands of followers on Instagram would be one of your dream but unfortunately it's not that easy as it sounds. For an average person, it is really hard to collect followers. First tell me the reason why people should follow you. Are you celebrity or public figure? No. The fact is, people won't follow you unless you are famous. Same rule applies on brands and businesses also. First you have to start by customizing your basic profile elements like username, bio, website and profile picture. Your username should be short, simple, unique and easy-to-remember. Don't add numbers and special characters in it. Username is more important than your name. People can use it to tag and find you on Instagram, so use it wisely. Next, you have to write an eye-catching and professional bio. When you visit someone's profile, bio is what tells about the person. Just write who you are and what you do. Give people a reason to follow you. Don't forget to add proper keywords in your bio. Remember that, first impression is the last impression. Then, add your blog or website link in the given section. Adding your custom domain name will give a professional touch. However, if you don't have any website, you can create your free personal page on about.me. Otherwise, link it to your Facebook or Twitter profile. Another important thing is your profile picture. Here you can upload your company logo or if its your personal account, use your own picture. Our aim is just to give a professional touch to your Instagram profile so that it can attract your potential followers. There is an option in settings which lets you make your Instagram account private so that only approved followers will be able to see your photos and videos. It would be of no use to make your Instagram account private unless it's your personal account. People should know who they are following and for that, your account privacy should be public so that anyone can see what you have posted even when they're not following you. To change your account privacy, first go to your profile and click gear button (for iOS app) or three dots (for Android app). Now make sure that "Private Account" button is turned off. That's it. You can also connect your Facebook and Twitter accounts with Instagram. This will sync all your contacts and then your friends, who aren't following you, will see your profile in suggested users list. It will also make it easy for you to follow your Facebook friends and you can share your posts on multiple social accounts at the same time. Connecting your Facebook and Twitter account is very simple. All you have to do is, allow the app permission to your Instagram account. First launch the Instagram app and go to your profile. Then, click gear button or three dots. Under settings section, tap the "Linked Accounts" option. Now click "Facebook" from the list and follow on-screen instructions to link both the accounts. In this method, you will have follow other people and in return they will follow you back. As simple as it sounds. 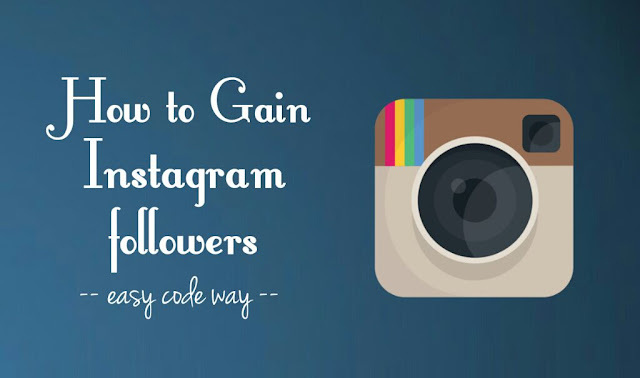 This is one of the fastest way to increase your Instagram followers. To find such people who will follow you back, search #followforfollow, #followme, #instafollow and other similar hashtags. You can also mention this in your profile bio. While posting a new photo or video, add these hashtags in its caption. You will start getting new followers within a short period of time. Make sure to follow them back instantly, otherwise they will unfollow you again. The more people you will follow, the more followers you will get. First start by following all your Facebook friends. To make your task easier, Instagram has an option to follow all people at the same time. Go to your profile and click menu button (three dots). Next, click "Facebook friends" option under the follow people section and then tap "Follow all" button. This will work only if you have linked both the accounts. Next step is to target some unknown people like your friends of friends. Check your follower's activities and discover new people to follow. It may happen that some people will not follow you back. So unfollow them again and repeat this process for few days. By liking and commenting on other's pictures and videos, you are increasing your profile visibility indirectly, which in turn will result into more followers. When you comment on someone's post, all of his friends will see it and if you have commented something interesting, they will follow you probably. Like every single post in your news feed. Explore new posts and comment as much as possible. Hashtags are miracle and you might not know their actual power. Basically, they are used for categorization purpose. When you add hashtag in a post, it will appear in results when people will search for that hashtag. This will boost up your post organic reach. Another benefit of using hashtags is that, they can increase your followers. We have already discussed about follow-for-follow technique. You can use any number of hashtags in a post but to make it spam free and more user-friendly, use 6-8 only. Note that, your hashtags should be relevant to the content and popular enough, only then they will give you some positive response. Call to action is a note that works as a bait to engage people in your post. For example, if you'll share your personal opinions on a particular topic or write something interesting, then your friends will reply back to you in the comments. Adding a caption to your post is a great way to engage with your followers and also gain new ones. Write about the picture, ask questions and include call to actions in every single post. Let me ask you one simple question. Will you follow someone who never post any photos? Most probably not. People needs fresh content and that's the primary reason why they are following you. It's very important to be active on your account. You should post photos regularly, at least one time in a day. Take selfies, edit them and share. It's a real fun. One thing which you need to understand is that, stick to your niche only. It would be pointless to post about movie reviews if your business is all about computer guide. Know what your audience wants from you and then create your own unique content based on it. While posting a new photo, you should add the location where the picture was taken. Either you can use GPS to add your current location or you can search places manually. Goetagging will unlock a new way to reach more audience. Your photo will be visible to everyone when they searches for the place where you have tagged it. It will be more relevant to tag your photos in general locations like your country's capital or a popular coffee shop in nearby area. People searching for that place will find your post there and probably they will follow you as you both have something in common now. This way, you can also collect few likes on your photos. If you've a personal blog or website, you can connect it with your Instagram account. For example, you can add your profile link in contact page or about the author section. Make sure to add call to action message like "Follow me on Instagram". You can also use Instagram follow plugin but that may slow down the page-loading time. This method will perform well only if you've good online reputation and your website is getting huge traffic. There are a number of third-party apps and websites available which can help you to gain hundreds of followers instantly. These services are both free and paid. They work in the same manner as Facebook auto liker works. Speaking frankly, I have never used such third-party services. Most of them will either ask you to complete the login process or you have to give an app permission to your Instagram account. There is a risk of security and that's why I don't recommend you to use them. By following this guide, you can easily gain 1k+ genuine followers on your personal and professional Instagram account. This may take some time but in the end, hard work will pay off. If you would like to add something, feel free to share it in the below comment box.